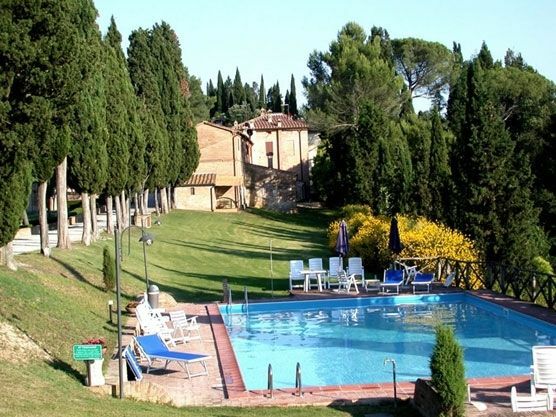 This country estate is composed of several buildings of historical and artistic importance; among them, the most beautiful is the main house with its typical Tuscan architecture. The villa faces a little private chapel, built in the 17th century, which is no longer used for Mass on Sundays. The apartments for guests are in two other close by buildings of this charming medieval estate. Every apartment is furnished with old Tuscan furniture.Ideal for large groups since Panorama 3 can be rented in conjunction with Panorama, Panorama 1, Panorama 2 and La Tenuta ( see properties listing). The immense grounds of 1,000 acres include tall trees and flowering hedges, as well as a tennis court and swimming pool.rnWireless internet. A clothes washer is available on the estate grounds, as well as a barbecue. There is a baby crib available.There is an outdoor area for al fresco dining. Three people are welcome in this two bedroom apartment. Centered on the living room fireplace are two comfortable sofas. A dining table seating six is part of the living room area. The bright kitchen is well equipped with stove, oven, refrigerator and dishwasher. One bedroom has a queen bed and the second bedroom has a single twin bed. There are two full baths in the apartment too. You will all enjoy the wonderful view of the countryside. The apartments are nicely furnished and very comfortable.